I love mystery, I enjoy the idea of not always knowing what something is or knowing everything there is to know. Mystery keeps us interested, guessing and wondering what will happen next. We need mystery or we'd never wonder, we'd never ask. And one of my favourite mysteries, is a scent that you can't quite gather what it exactly smells like, but you love it, it draws you in and captivates your senses. 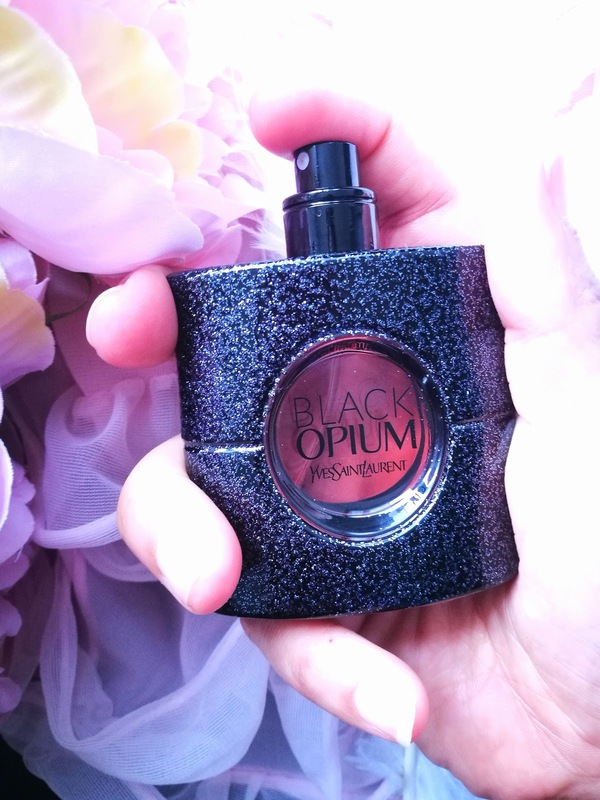 Yves Saint Laurent's Black Opium! This oriental & spicy woman's fragrance in it's new composition, a darker and more mysterious interpretation to it's original Opium. 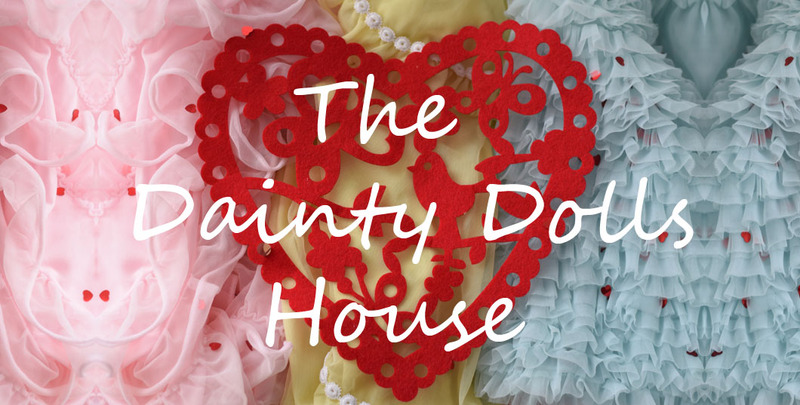 With notes of pink pepper, orange blossom, coffee, jasmine, vanilla, patchouli & cedar. From the first spritz your hit with a frolic in the deep dark woods, it's almost heady as if you're lost. And then bit by bit these sweet tantalising notes come out to play and then it seems as though they dance back and forth with each other, I love this balance, it never becomes too sweet or too heavy that it's choking. The balance of notes has been done to perfection. Strong enough for just a spritz and it lasts most of the day depending on what you're doing. The lingering scent of this is where I find this sweetened floral that I love the most, I find it on my coat at the end of the day and it just makes me stay there breathing it in over and over. This is a scent for someone who loves her perfume and isn't afraid to let others know she's wearing her perfume as it lingers. Someone strong or at least likes to appear strong and confident. It's a sophisticated scent, full of confidence and strength, perfect for those who have the confidence or just want to appear as so. I say that because some years ago, I would have never chosen a scent like this, because it's a noticeable scent and I wouldn't have wanted anyone to notice me due to lack of confidence, I would have chosen something light, sweet and only noticeable to myself. But, now having more confidence, I say this is a perfect fragrance to stand out in. The bottle is eye-catching with it's glittery bottle that catches the light so nicely in the boudoir. 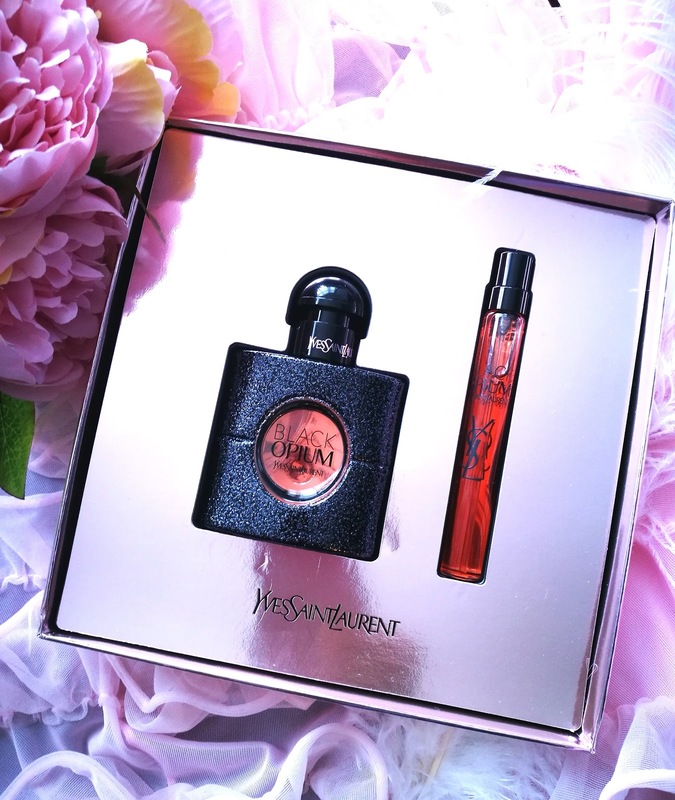 My gift set came with a 10ml eau de parfum handbag spray along with the 30ml eau de parfum bottle. I was unsure in getting the big bottle as I was stuck between this version and the floral shock version of Opium. The 30 ml accompaniment is perfect for taking with me in my bag, so that I can spray it should I ever need to revive the scent or whenever you get stuck in places that don't smell so nice, ha! 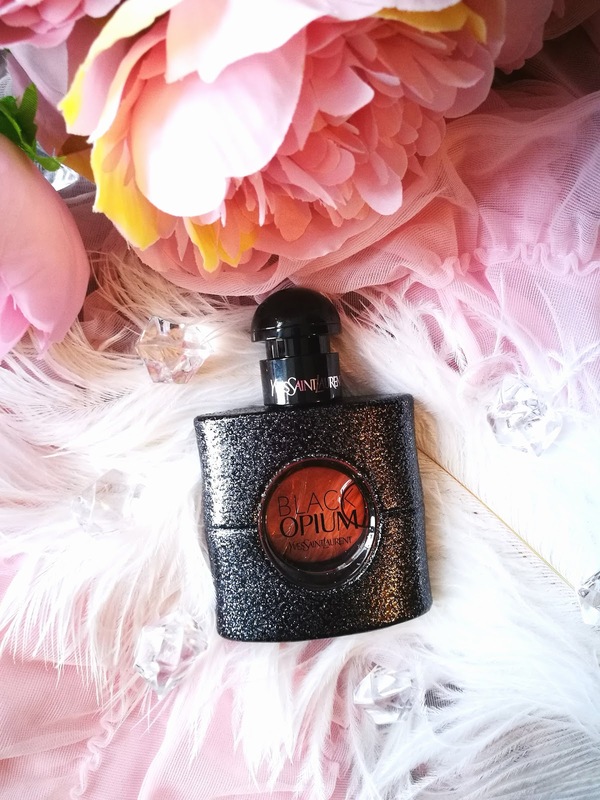 My gift set was bought in Boots for a Christmas special (you can still get Black Opium in Boots, just not this specific set), but you can easily find Black Opium on Amazon (US & UK ) and in any good perfumeries online & in different countries. Just beware that some countries won't ship to another country due to it being a flammable. I love it and it's definitely been on rotation as one of my signature scents, is it my perfect scent? - Almost, but not quite. But, I would definitely recommend this to anyone as I do love wearing it. Have you tried Black Opium? I hope you have a great day dolls. I have this fragrance, is my favorite of DIor! I haven't tried it but I heard it is pretty amazing. Lovely review and beautiful presentation. You review the perfume like I would review a nice bottle of red wine. The packaging is so attractive. The fragrance sounds wonderful. Thanks for sharing your experience with us. Wow, the packaging is awesome. You have clicked it so beautifully. Would love to try it out. This is such a gorgeous fragrance! I keep wearing the floral version of this fragrance this month, it's beautiful! Just lovvvvvin' the packaging and the sparkles! STUNNNNING pic! I have heard so much about this, it sounds like it would be absolutely gorgeous. I'd definitely love to give it a go, even from just the flawless packaging. 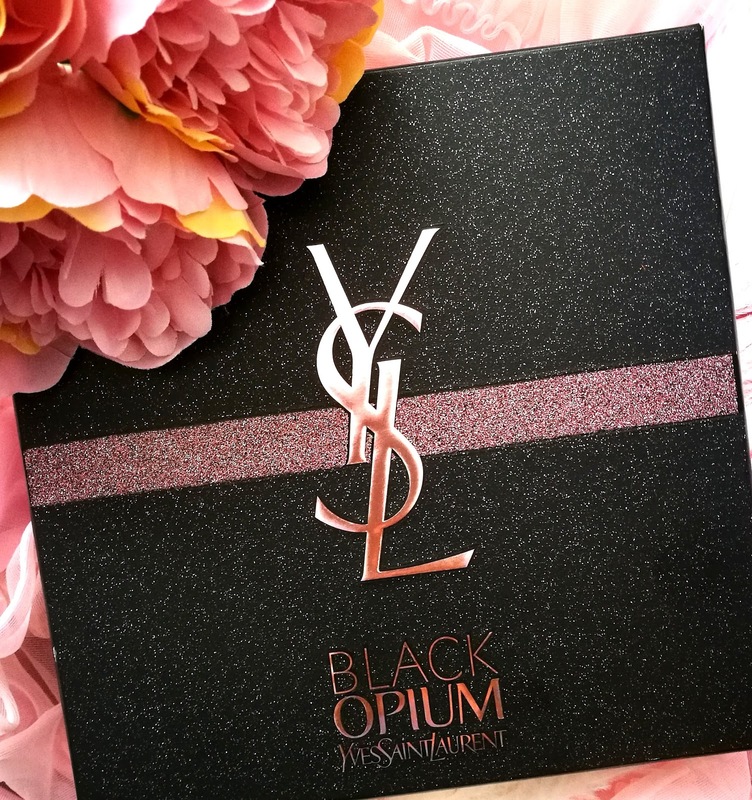 Nice packaging on the YSL Black Opium. It looks like a spicy fragrance. Thanks for the review. I definitely haven't tried this scent and you made me so curious to try it. Happy you shared how it makes you feel! While its a great great scent, I LOVE your pictures! Total life!! !